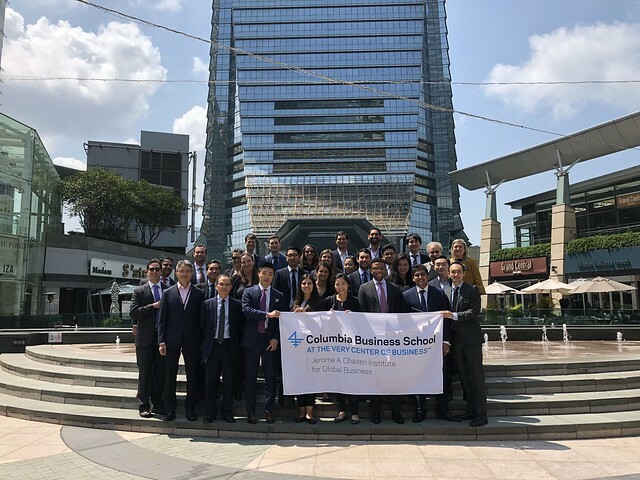 From March 12th to 16th, 2018, 30 Columbia Business School real estate students and administrators traveled to Hong Kong and Shanghai, learning about the market in China and meeting with both local and foreign real estate companies. Over the past few years, one might argue that no group of investors have made a bigger mark in the US real estate market than the Chinese. From Chinese airline turned global conglomerate, HNA, to insurance company turned investor, Anbang, as well as conglomerate Wanda, these Chinese investors have been buying up some of the biggest trophy properties in the United States, including the Waldorf Astoria, 245 Park Avenue, and other large office and hotel properties. These investors are scooping up prize properties across the country and partnering with some of New York’s most established companies. The Chinese government, concerned about potentially risky overseas investments and capital outflows, began to enact capital controls in November 2016. Chinese investment in the US began to slow but large acquisitions continued, such as HNA’s $2.21 billion purchase of 245 Park in May 2017. The clampdown came to a head in early 2018: Anbang was seized by the China Insurance Regulatory Commission and the firm’s chairman, Wu Xiaohui, was charged with financial fraud. HNA is facing a debt crisis and is selling assets. With all this recent news in mind, we were curious about the real estate sentiment that we would encounter in China. Most of our meetings were with local companies in Hong Kong and Shanghai and our perspectives broadened with the insights from locals. Despite alarms that were being raised stateside, the local real estate experts that we encountered were optimistic about the state of the real estate in China. Our trip began in on a sunny Sunday in Hong Kong and a first glance at the city’s impressive real estate from Victoria Peak. The group’s first day offered in-depth discussions of Hong Kong and global real estate from a wide range of presenters and hosts. We started bright and early Monday morning with a comprehensive overview of the Asian real estate market by Shane Taylor AC’04 Head of Research and Strategy for APAC at CBRE and graduate of the Columbia MSRED program. We discussed growth projections in the different Asian markets and, as we would continue to hear throughout this trip, we learned that despite a slower growth rate projected in China, real estate investors are still bullish on the market. We then focused in on Hong Kong investment with one of the oldest property developers in town, Hong Kong Land, a publicly traded company that is part of Jardine, Matheson & Co. We met with Clement Lau, Head of Development and Valuations, and Wesley Chan, Senior Development Manager. Hong Kong Land has an extremely large presence in its namesake city with an office and luxury retail portfolio of 450,000 sq m (4.8 million sq ft) and solidified their influence in the city by building the first above-ground walkways, an extensive footbridge network that connects Admiralty, Central and parts of Sheung Wan. A highlight for many on our trip was a tour of the Asia Society Hong Kong Centre’s Robert Indiana exhibit, and a fireside chat hosted by Ronnie Chan, Chairman of Hang Lung Properties and billionaire real estate developer. Eschewing our typical meeting format, Mr. Chan led an informal discussion, offering his candid views on different real estate markets, and riding out cycles. He debated with us about the risks associated with emerging markets versus developed markets, proposing that sometimes the risk is worth it. For many of us, this challenged our views that developed and stable economies are the safest, but Mr. Chan argued that without growth, you inherently take on risk. Our first day ended with a presentation from Dorsett Hospitality and a tour of the Dorsett Wanchai Hotel and their “themed and family” rooms. We learned about how the company is positioning themselves to take advantage of the large number of Chinese tourists and some of their other business lines, including their car park platform. Coming from New York City, we know what it is like to live in a highly populated and dense urban area. Fitting its 7.4 million residents into just over 1,100 square kilometers is remarkable and this stat becomes mind-boggling when we learned that three-quarters of Hong Kong’s land is green. This results in extremely high rents and prices—even by New York standards—and it also results in innovative developments to cope with the severe lack of developable land. One of the most innovative development models that we encountered on our real estate focused trek has been the Rail + Property model implemented by the MTR (Hong Kong’s mass transit railway). With the expressed purpose of capturing the value creation that a new railway line will have on the surrounding land, the publicly-traded MTR is able to operate at a profit. When the MTR develops a new line, they obtain land development rights from the Hong Kong government. They then work with a development partner to build on top of the station site and share in a portion of the development profits, usually by receiving either a percentage of profits, fixed lump sum, or a portion of the properties built on the station. In fact, the vast majority of profits earned by the MTR is from the management of assets developed as part of the Rail + Property model. While many cities have been focused on transit-oriented development over the past few years, Hong Kong and the MTR have been building on and around transportation centers for decades. Approximately half of Hong Kong’s subway stations have a development above. As we learned from MTR (and experienced as we moved around the city on our own) the MTR is exceptionally well-run with over 99.9% of trains running on time. Following our discussion with Kelson Chan, Strategy and Planning Manager, and Steve Yiu, Principal Advisor, Property Planning, we toured a prime example of the Rail + Property model at Kowloon Station, one of Hong Kong’s busiest subway stations. The station is complete with underground retail and is the site of the International Commerce Centre, Hong Kong’s tallest tower. The MTR is a relatively new public transportation system, which was established in the 1970s. Building an extensive subway system like Hong Kong’s is a daunting task especially when you consider the financial challenges that many public transportation systems face. The Rail + Property model efficiently allows for the capture of value increase resulting from investments made in infrastructure. Hong Kong’s highly dense population and low car ownership makes this city the perfect location for this type of model. It will be interesting to see how this model can be adapted in other cities. Many of the companies that we had met up to this point, viewed real estate as a very long-term investment. Representatives from Hong Kong Land had remarked that they rarely sell, while MTR’s strategy was generate cash flow from the properties they developed with partners. Pamfleet, a real estate investment advisor, seemed similar to the real estate private equity firms we know back in the US. They run a number of value add funds and walked us through several repositioning case studies. Speaking with CEO Andrew Moore and Principal Kelvin Wong, we learned about some of the key differences between Hong Kong and American/European investing. We wrapped up our final day in Hong Kong with property tours with Joseph Fuqua, Head of Investor Relations, and Esther Lui, Assistant Vice President Asset Management, of Phoenix Property Investors. We toured an empty space on the 20th floor of a tower in Central and were surprised to learn that its intended user is food and beverage. This is not unusual in Asia, but very rare in the US. We also toured one of Hong Kong’s first WeWork locations in Tower 535 in Causeway Bay, one of the busiest shopping districts. Our final meeting of the day was with Shawn Tsai, Associate, and Herbin Koh, Analyst, at Gaw Capital where we learned about their global investment strategy, with a focus on mainland China. The day ended where we started: at the International Commerce Centre. Morgan Stanley generously hosted a networking reception in their office, where we met with local alumni and even a few incoming CBS students in Hong Kong. Similar to our first day in Hong Kong, we started with an overview of the Shanghai market with James Shepherd, Managing Director at Cushman & Wakefield. One of the most striking takeaways was the how fast the Chinese office markets move. Cities see tens of millions of square feet being added to the office inventory over a couple of years (compared to just a few million square feet). The market changes so quickly that landlords don’t want to be locked into leases longer than three years, and the large safe anchor tenants that are so coveted in the US are passed over in China in favor of smaller tenants with limited power over the landlord. One of the messages that we received again and again from the real estate experts that we met in China was that brick-and-mortar retailers have already gone through many of the growing pains associated with e-commerce and learned the importance of “experiential retail” years before it became a buzzword in the US. We met with Value Retail at their newly opened Shanghai Village. Located near the Shanghai Disney Resort, the luxury outlet mall is well-positioned to attract nearby tourists. Meeting with Caleb Perrin AC’05, Head of Development and a graduate of the Columbia MSRED program, and Lillian Cheng, Senior Manager, it was clear that value proposition of Shanghai Village was hospitality and experience, rather than just a retail offering. Our hosts began the tour with a discussion in the VIP hospitality room, where shopping guests can relax, enjoy refreshments and have a concierge assist them with anything they need. Shoppers can also register so their purchases will be sent to concierge to be picked up at the end of the day or shipped directly to their homes. Boutiques were spacious and uncluttered, reminding us more of 5th Avenue retailers rather than a typical US outlet mall. The one design challenge that our group noticed was the open-air concept. While common in US and European outlet shopping centers, poor weather and air quality keeps customers away. We visited Shanghai Village on a rainy weekday and noticed very few shoppers around. We built on our retail tour with a tour of Swire’s HKRI Taikoo Hui, a mixed-use development in Shanghai’s vibrant Jing’an District with two office buildings, a retail mall, and three hotels / serviced apartments. We met with Thomas Woolsey, Senior Portfolio Officer, Tom Spicer, Assistant Director of Portfolio Manager, and Kelly Wu, Assistant Portfolio Manager for a tour of the office and retail components of Taikoo Hui. The luxury boutiques are well-suited for the upscale neighborhood and the site contains the world’s largest Starbucks (29,000 square feet). The Starbucks Reserve Roastery is a highly experiential concept. The spaces doubles as a coffee factory and guests can learn about the roasting and brewing process while tasting coffees from all over the world. While coffee shops are not as vulnerable as fashion retailers to e-commerce, the Starbucks Reserve serves as a major draw to both locals and tourists for the shopping center. One of the most memorable activities for our group was a visit to Shanghai Tower, the world’s second-tallest building. Standing at 2,073 feet, the tower opened to the public in 2016. After admiring the building from within, we met with Edward Chao, Principal at Gensler, the architecture firm that designed Shanghai Tower and got the inside scoop on how the tower’s design came to be. We learned about how the building’s asymmetrical and tapering structure is designed to withstand Shanghai’s typhoon-strength winds. To further ensure stability, Shanghai Tower has 1,000-ton damping system which we had toured the day before. Our final day was rounded out with meetings at Vanke, one of China’s largest residential developers, where we learned about how they are positioning themselves to providing housing for China’s mobile middle class in a culture that highly values homeownership. The official part of the tour capped off with a meeting with Angelo Wang ’15, Head of Strategy Development at Fosun Property, where he shared insight on what’s driving the residential development in China’s cities (massive urbanization) and the eye-popping speed at which developers can complete towers (6 months). For those keeping count, by the end of the week, our group had met with 14 different companies. For those of us who hadn't had their fill just yet of Shanghai real estate, we were able to schedule a meeting with Derek Hrzek at Hines on Saturday morning for a capstone discussion on real estate investing in China, and an exclusive tour of One Museum Place, which is set to open imminently. After meeting with so many local Chinese companies, it was interesting to step back and see the perspective of an American company operating in China. He was able to shed some light on the challenges faced when navigating the Chinese government and real estate environment. Our trip to China was a whirlwind learning opportunity and provided great insights to an exciting market. Many thanks to the student organizers, the Chazen Institute, our faculty and Paul Milstein Center sponsors, Executive-in-Residence Leanne Lachman and Managing Director Kristin Svenningsen, all of the companies that met with us, and all of the students who joined the trip. Robin Lore ’19 is a first-year student focused on real estate and is AVP of Trips and incoming Co-President of the Real Estate Association. Prior to Columbia Business School, Robin worked at Bentall Kennedy, a North American real estate advisor, on both the investment management and corporate teams. She will be joining PGIM’s Real Estate team for her summer internship. Robin graduated from the University of British Columbia with a BCom in Finance and Real Estate and is a CFA Charterholder.